Destiny may be written in the stars, but you have the power to shape it. In Pan’s Script, Elkie White offers a treasure trove of vital information about you, your loved ones, and your life, through astrology and numerology, combined. explore the implications of your astronumerology for your career-path and relationships. Based on careful research and the refinement of formulae from thousands of case studies, Pan’s Script teaches you about yourself as it reveals your Astronumerological DNA, because to know, is to understand. Click here for a blog where Elkie talks about why she wrote the book, what it covers and how her conclusions about the nature of astronumerology go beyond anything that has been written to date. Elkie uses the system she developed through writing Pan’s Script to produce personalised reports, called Your Unique Self. All she needs is your date, time and place of birth along with your given name at birth. Click this ‘Play’ arrow to hear Elkie talking about the sort of insights to be gained from a report on Your Unique Self. Linda Marson provided her ‘vital statistics’ and Elkie talks with her about what her Aries 1 Astro Number Signature reveals about her personality and approach to life. For more information, email Elkie at whitelk@bigpond.com or visit this page on her website. 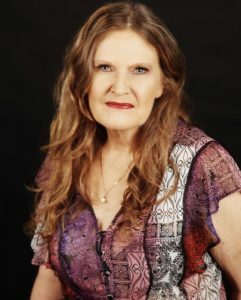 Elkie White has been a student of the Numbers since the mid 1980s and a student of Astrology since 2000. She has formal qualifications in both. At the turn of the millennium she began writing Pan’s Script based on a combination of the two modalities. In 2005 she started applying her findings to reports for people called Your Unique Self. These are not simple or computer-generated, but personally written by Elkie to help people appreciate their complexities, their potential, and their totality. As well as the reports, Elkie offers workshops, and a correspondence course, for people who want more personalised tuition. Elkie has been a member of the Order of Bards Ovates and Druids (OBOD) since 1995, and believes that her work in astronumerology is an extension of the beautiful nature-based spirituality called ‘druidry’. In 1998 she founded The Melbourne Grove (of OBOD), in order to celebrate the wheel of life, per the seasonal calendar, with like-minded people. Becoming a celebrant then sprang from this experience. As a professional celebrant her focus is on the cycle of life represented by births, deaths, marriages, and other significant rites of passage. Like astronumerology, it can be deeply personal. Copies purchased through this website are signed by Elkie. We are only selling to customers in Australia and New Zealand, since the cost of international postage from Australia is high. Conversion to $AUD or NZ happens at the checkout. If you don’t live ‘down-under’, you can purchase Pan’s Script through Amazon, though, unfortunately, it won’t be a signed copy.